For the first time, the UFC will visit Liverpool, England this Sunday with a special event headlined by local favorite Darren Till taking on former two-time title challenger Stephen "Wonderboy" Thompson. Till quickly became one of the most talked about fighters on the UFC roster when he dispatched Donald "Cowboy" Cerrone in impressive fashion last October. Now the British welterweight will attempt to step into title contention when he takes on arguably the best striker in the entire division. Thompson has built his reputation on becoming one of the most precise and dangerous fighters on the feet that this sport has ever known. He's gone 10 hard rounds with welterweight champion Tyron Woodley and most recently outclassed Jorge Masvidal over three rounds to earn a lopsided unanimous decision. Elsewhere on the card, Neil Magny will make his return to action against late replacement Craig White, who joins the UFC with an impressive record on the U.K. fight scene. Top prospects Arnold Allen and Mads Burnell will also do battle, and Makwan Amirkhani returns to take on nasty grappler Jason Knight. In today's fantasy preview, we'll examine these fights and several more to see who has the edge and who might be primed for an upset at UFC Fight Night: Thompson vs. Till. In a battle between two knockout strikers, Stephen “Wonderboy” Thompson will travel into enemy territory to face Darren Till in a bout that could have huge ramifications for the welterweight division. For Till, this is not only a chance to shine in his hometown but it's also an opportunity to prove he belongs amongst the elite fighters at 170 pounds after his stunning knockout win over Donald "Cowboy" Cerrone last year. Till is a massive fighter for the welterweight division who hits with power while showing a very versatile game on the feet. Till's ground game hasn't been tested much, but that probably won't matter in this matchup, where he'll take on another noted striker in Thompson. Till is a very aggressive fighter who loves to put the pressure on his opposition with big, powerful combinations where he comes forward with punches in bunches. Till will almost always have the size advantage in his fights, although he will be giving up an inch of reach to Thompson on the feet in this particular matchup. Till hits with pure dynamite so he only needs to connect with one or two shots and he can put anybody's lights out. It's that stylistic matchup that makes this a tough fight for Till because for all his power, he loves to be the aggressor and that plays right into Thompson's skill set. Thompson is a master at stepping back and catching fighters coming towards him and that's exactly what Till does throughout almost every exchange. Thompson is also deceptively patient, so he won't make many mistakes to give Till an opening to hit him unless he's coming forward. That kind of resolve can hamper the offensive output of his opponents and Till isn't immune to getting frustrated when Thompson forces him to step into one of his brutal fight finishing combinations. Thompson proved in his last fight the difference between his elite striking and everybody else who might be pretty good. Till is better than that but he still hasn't faced the kind of striking acumen that will be unleashed against him this weekend. Look for Thompson to bide his time in the early going while Till feasts off the energy of the crowd while looking for the finish. If that doesn't come, Thompson will then begin to methodically pick him apart and, by the latter part of the fight, he should remain in control or put together a combination that will hand Till the first loss of his career. Two fierce, young up and comers will square off on the main card in Liverpool as Arnold Allen looks to remain undefeated in the UFC when he takes on Denmark's Mads Burnell. Burnell has gone 1-1 in his two UFC fights but his loss came against Michel Prazeres, who is regarded as one of the toughest matchups inside the Octagon with his nasty ground game. Burnell powered back in his last fight with a unanimous decision win against Mike Santiago and now he'll look for another victory when he returns this weekend in England. Burnell is best known for his own grappling game, where he's wrapped up a ton of submissions during his career, including a rarely used Japanese necktie which helped him win back-to-back fights in 2016. Burnell is no slouch on the feet either, but he'll have to mix up his striking attacks if he wants to deal with Allen in this particular matchup. Allen is primarily known for his talent on the feet after beginning his martial arts training as a teenager. Allen went on to test himself in both kickboxing and boxing before turning his full time attention to mixed martial arts. Allen is very slick on the feet, with fast combinations and good accuracy. Allen's best weapon in this particular matchup could be the lacking defense of his opponent. Burnell gets hit with nearly double the amount of strikes per minute and has only blocked 39 percent of the strikes against him in his two UFC fights. That's a tough number to deal with on the feet, considering Allen will probably be coming after him with a striking-focused attack. Allen will enjoy a slight reach advantage as well, so that will also help him to keep Burnell at a distance. Now strangely enough, Allen actually averages way more takedowns per fights than his opponent so he might mix in some wrestling as well just to keep Burnell guessing. Still, considering Burnell's willingness to mix it up on the ground and his submission arsenal, it's more likely Allen will use a defensive wrestling game to keep the fight standing. If Allen is able to keep Burnell at a distance and then stay on top if the fight hits the ground, he should be able to work his way to a decision victory in Liverpool. Prediction: Arnold Allen by unanimous decision. This featherweight matchup has to be an early favorite for Fight of the Night, as Jason Knight takes on Makwan Amirkhani in a bout between two of the most animated fighters in the 145-pound division. Both athletes are looking to bounce back from recent losses, so this fight has plenty on the line for Knight and Amirkhani. In his first few fights in the UFC, Amirkhani looked like a future contender in the featherweight division with a dynamic striking arsenal coupled with a slick submission game. Amirkhani is explosive with his combinations, although he's not the most active fighter on the feet. Amirkhani is a ground specialist with a long history in wrestling, which he's used to average more than four takedowns per fight. Amirkhani is best when he's able to control the pace of a fight with his grappling game, but he'll have to be careful with that strategy against a submission specialist like Knight. Knight has an incredible ability to seemingly pull a submission out from anywhere, so he'll definitely invite a ground battle if that's what Amirkhani wants. Knight nearly averages two takedowns per fight as well, and he's particularly dangerous in the scrambles. Knight will happily feast on the slightest mistake, especially if Amirkhani isn't careful when he's shooting in for his takedowns. The difference in this fight is Amirkhani's ability to drag the action to the mat and then avoid Knight's submissions. If he can handle that, Amirkhani has a great opportunity to pull off the win. The key will be not getting caught in those scrambles on the ground because that's where Knight lives and breathes. He'll gladly give up a takedown if he can bait Amirkhani to fall into one of his traps on the ground. Knight is long and lanky so he's got a nasty series of chokes and he'll wrap up Amirkhani if he makes the slightest mistake on the mat. Still, Amirkhani's wrestling should be enough to allow him to maintain control, but if he makes one wrong move, Knight will definitely make him pay for it. Following an injury to Gunnar Nelson, Neil Magny will now take on late replacement Craig White in the welterweight co-main event. White is no slouch stepping into this fight on late notice, and he was already preparing for a bout when he got the call so he's been deep into training camp already. White is a crafty veteran who has a good overall mixed martial arts game, including a very solid submission arsenal off his back. In fact, White has wrapped up two of his last four wins by triangle choke while finishing the other two fights by guillotine and TKO. In other words, White is always looking for the finish, with an offensive output that will definitely give him the chance to pull off the upset. 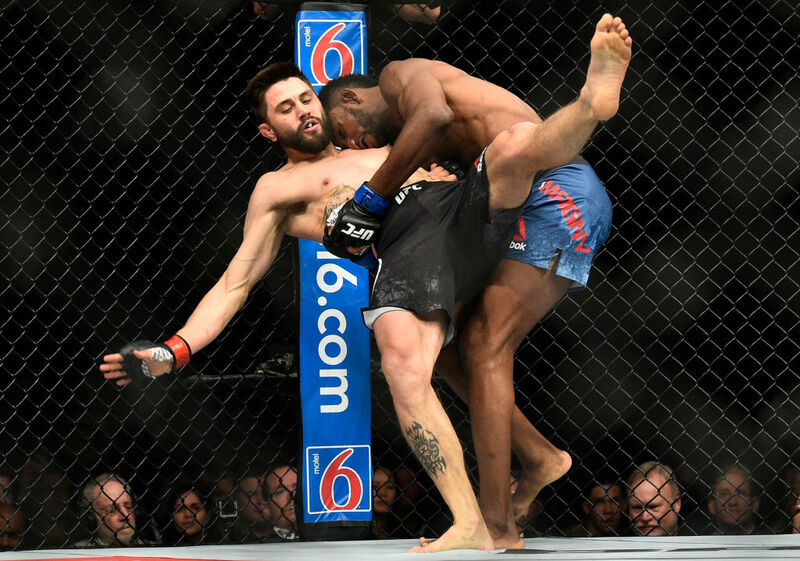 That being said, Magny remains one of the most underrated fighters on the entire UFC roster because he's not the loudest guy in the room but he always seems to find a way to get the job done. Magny is a long, rangy striker with good hands and he'll certainly mix in a few takedowns where necessary. Magny will enjoy a four-inch reach advantage, so don't be surprised if he uses that to keep White on the end of his punches until he decides to mix things up with a takedown. Magny is well versed in all facets of the game, although he has struggled at times with top-notch submission stylists like Demian Maia and Rafael Dos Anjos. That being said, for all of White's submission wins, he's not a ground wizard like Maia or Dos Anjos, so while Magny will have to be careful, he shouldn't be in nearly as much danger on the mat in this fight. Look for Magny to control the range on the feet, mix in a few takedowns and then ratchet up the pressure on White as the newcomer deals with those infamous Octagon jitters in his first UFC fight. Top prospect Manny Bermudez will make his second appearance in the UFC this weekend as he takes on Ultimate Fighter veteran Davey Grant. Grant has bounced back and forth between wins and losses in his most recent fights while struggling a bit to find his footing in the UFC after appearing on the reality show. At his best, Grant is an imposing fighter who will outsize most of his opponents. That won't be the case this weekend, however, as Bermudez will have him on both height and reach in this bantamweight matchup. Bermudez is an incredibly slick ground fighter with a bevy of submissions on his record. While his wrestling isn't the best, Bermudez has an innate ability to find openings with the slightest mistakes of his opposition and then seize on it with a long list of weapons on the ground. Bermudez has a nasty guillotine choke that he'll certainly apply if Grant is the least bit sloppy if they get locked up in a clinch position. Now Grant may try to keep this fight standing, which would certainly be his safest path to victory. Still, Grant's striking isn't so world-class that he'll just be able to keep Bermudez at range all night long. Chances are Grant will eventually get locked up in a clinch or a scramble on the mat and that's where Bermudez will start fishing for submissions. Grant has struggled at times avoiding mistakes on the mat and that's exactly where Bermudez lives and breathes. One wrong move means Grant will end up in the worst possible position, with Bermudez seizing up on a choke to finish the fight. Former Ultimate Fighter winner Elias Theodorou will look for his fourth win in his past five fights when he takes on always-tough middleweight Trevor "Hot Sauce" Smith in Liverpool. Theodorou has only suffered two setbacks during his career, with both coming against legitimate top 15 talents in Thiago Santos and Brad Tavares. In both fights, Theodorou certainly had his moments, so it's justified that he's earned a top 15 ranking of his own with impressive wins over the likes of Dan Kelly, Sam Alvey and Cezar Ferreira. Theodorou can best be described as a “jack of all trades” because he doesn't do anything that stands out above the others, but he's definitely good everywhere. Theodorou is a painfully frustrating fighter to deal with on the feet or on the ground because he's just as solid defensively as he is offensively. Theodorou is a high output fighter on the feet or on the ground, but his ability to avoid taking damage might be one of his best weapons. Now Smith will almost certainly look to take this fight to the ground at some point with his background in wrestling. Smith averages two takedowns per 15 minutes in the Octagon but he's also very adept at taking advantage of the slightest slip up to put the fight on the mat and keep it there. Smith's ground control can be stifling at times, so that's probably the last place where Theodorou wants to be in this matchup. Thankfully for Theodorou, he has shown very solid defense on the ground while mixing in nearly as many takedowns per fight as Smith. On the feet, Theodorou is slightly more active in volume while once again possessing better defense as well. Theodorou won't do anything flashy but that also helps him stay out of trouble, which is what will probably frustrate Smith to the point of exhaustion in this matchup. As time ticks away round by round, Theodorou will begin peppering away at Smith while stuffing his takedowns and that should all lead to a unanimous decision victory for the Canadian. It's been more than three years since Claudio Silva last stepped foot in the Octagon, but he'll make his long awaited return this weekend against Canadian knockout artist Nordine Taleb. When he was forced out of action with a foot injury that required several surgeries and nearly ended his career, Silva was riding an 11-fight win streak, including two victories in the UFC. Silva's last win came against Leon Edwards, who has been on a tear lately while working his way into the top 15 in the welterweight division. Now make no mistake, Silva is going to be fighting an uphill battle after coming back from such a long layoff while facing a really tough challenge in Taleb. Taleb has won three of his past four fights in a row with two vicious knockouts decorating his recent record as well. Taleb's only setback came against top 10-ranked welterweight Santiago Ponzinibbio in a three-round battle. Taleb is very dangerous on his feet, where he hits with solid volume and devastating accuracy, with more than 54 percent of his shots landing. Taleb is also very tough to deal with defensively while stopping nearly 70 percent of the strikes against him. That being said, Silva definitely has the kind of arsenal to deal with Taleb - assuming he's able to knock off the ring rust and get back into a rhythm in the early going in this fight. Silva is well versed enough on the feet that he can throw hands as long as he doesn't get too aggressive, because Taleb will definitely make him pay for that. Silva also mixes in three takedowns per fight on average, which could be his best offensive weapon to ground Taleb's potent striking attack. Taleb has shown great takedown defense while stuffing over 72 percent of the shots against him, but that doesn't mean he won't leave himself open for a potent wrestling attack if Silva can get his timing down. The key for Silva is mixing up his striking and ground game to keep Taleb guessing. If he can do that, Silva has a great chance to pull off the upset and stay undefeated in the UFC in his return to the Octagon. Remember, on paper, Taleb is a heavy favorite, especially dealing with an opponent coming back from such a long layoff. Still, Silva looked like a legitimate threat to the top 15 when he was part of the active roster previously, and this fight will give him a chance to shine again in his return.